Instantly recognisable in image and sound, the band is fronted by the girl/guy vocals of Claudia Schmidt and Pete Sotiropoulos. There is an unapologetic originality in their fresh melodies, tangled harmonies, and gritty guitar lines, with a grungy disco vibe which lurks beneath it all. Turning heads for the last two years, they are quickly becoming a celebrated name in Sydney’s Inner-West. 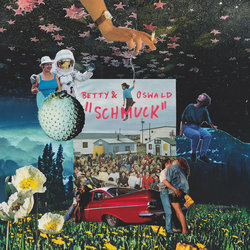 Betty & Oswald emerge back onto the scene with their new single, Schmuck. Recorded at Sydney’s Studios 301 and produced, mixed by Simon Todkill (The Griswolds / The Rubens / Matt Corby), Schmuck is homage to the strange and beautiful, the confidence of the loner and his no fucks attitude.